I have a hidden secret, a particular bizarre streak, a deep dark twist in my personality and I feel the need to come clean about to the gnb community. Have you ever wondered who in the hell stops at South of the Border SC or who goes to the Corn Palace in SD? If you ever questioned how the hell they make any money at those places I am here to tell you; it is from crazy people like me. I love this stuff! On my trip to Prince Edward Island with my mother many years ago, I made the poor woman (she is up for sainthood) drive almost one hour out of the way to go see this. 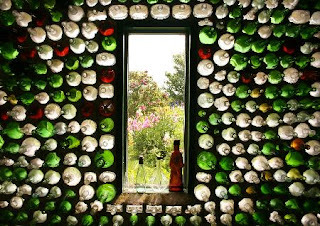 This crazy but beautiful collection of three little buildings all made of bottles is exactly the kind of thing I am talking about. It is an example of celebrating the strangeness of human interest, ingenuity and imagination. I am a sucker for all of it. If you ever saw the odd little Travolta film, Michael -- you will know why I had a soft space in my heart for his character. I definately must see the world's largest frying pan someday. 2. the Salem Witch Museum "more weight." 4. Several versions of Ripley's Museum -- before they became popular and quadrupled in number. 5. Madame Tousseau's - Of course! and a ton of other little out of the way places I have since forgotten in my travels. I plan on visiting the Tobacco and Salt Museum in Tokyo one of these days. Roadside adventures are around every corner. I think these spots, this phenomenon is all about the little strange quirks in the human mind, the love of the extraordinary, a touch of OC gone to the perfect side of creative extreme. But then I am a little bit crazy, so what do I know? I wonder if Obama or Clinton had the time to visit Behn's Game Farm during their Wisconsin campaigning travels? Anyone know of any good little destinations I should be adding to my "must see" list? I promise I won't tell my family who my sources were so as to protect you from their groaning and complaining!